The East Bay Express way is 19 KM long controlled access road. The East Bay express way will connect the Gwadar International Container terminal with the Gwadar Free Zone, bypassing the Gwadar city. 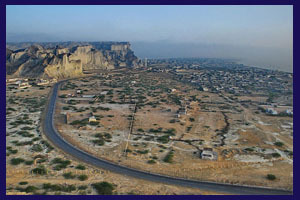 The East Bay Expressway eventually links the Makran coastal highway to Gwadar international Container Terminal. The Project is being constructed by the Gwadar Port Authority (GPA). The Express Way shall facilitate economic activities at the Gwadar international terminal as it provides immediate and uninterrupted connectivity with the hinterland.